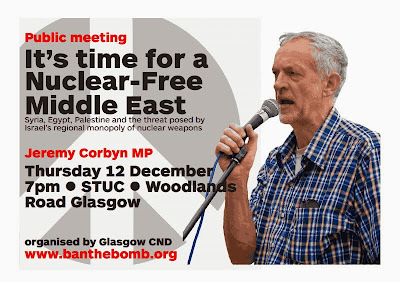 On 12th December Glasgow CND is holding a public meeting entitled ‘It’s time for a Nuclear-Free Middle East’. The speaker will be CND vice-chair Jeremy Corbyn MP. Jeremy will explore the armed conflict in Syria and the social upheavals in Egypt in the context of the campaign for freedom, justice and statehood for the people of Palestine. In particular, he will highlight the ongoing threat posed by weapons of mass destruction in the region. At a time when Syria’s chemical weapons are being destroyed by UN inspectors and Iran has agreed to negotiations over its nuclear power programme, surely it is time for Israel - the only nuclear weapons state in the region - to come clean about its nuclear arsenal and place them under international supervision and control.